In 1990, rhums market share was down to 5% on the French spirit market1. Rums have a 11% share of the worldwide spirit market and are the third most sold spirit just behind whisky and brandy. On the other hand, it is the best selling spirit in its category of clear spirits, followed by vodka and gin. 20% of the rum world production is sold on European markets. a shrinking market share in France as spirit volumes are increasing. a harsh competition in the rum market segment from traditional rums (molasse rums) with cheaper labour and raw material costs. French sales has been divided by a factor 2 in 20 years, slipping from the equivalent of 135'000 hectolitres of pure alcohol (H.P.A.) in 1970 to 70'000 H.P.A. in 19901. Meanwhile, spirit sales increased from 850'900 H.P.A. in 1965 to 1'420'000 H.P.A. in 1990. Martinique rhum agricole is more expensive to produce, due to the high cost of labour in Martinique, compared to neighbouring countries such as Jamaica, Cuba or Brazil. Molasses being by products and requiring less care in handling are also cheaper raw materials compared to fresh sugar cane juice. To protect Martinique rhum agricole, producers worked on creating an high end image for their product. The higher range perception would explain the higher price of Martinique rhum agricole in consumer's minds. The decision to seek an A.O.C was made as early as 19752. The A.O.C's purpose was to extend the legal protection entitled to rums produced in French overseas regions. The A.O.C request did not succeed for technical reasons on its first attempt and in 1989 the FENARUM (National Federation of Rhum Producers) filled another request. In 1993, an expert committee is designed to write the AOC specifications. This committee defined geographical limits for cane cultivation and standard production techniques (distillation columns, ageing, fermentation, ...) to caracterise the rhum agricole product. As it is the case in most AOC specifications, these limitations were intended to include most current production caracteristics to ensure that rhum would always be produced the same way in the future. Download page 1 of the 1996 decree (French). Download page 2 of the 1996 decree (French). Download page 3 of the 1996 decree (French). 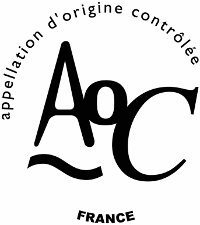 Appellation d'Origine Contrôlée (AOC) is the French equivalent to EU's Protected Designation of Origin (PDO). Protected Designation of Origin (PDO) is one of the geographical indications defined in European Union law to protect the names of regional foods. The law ensures that only products genuinely originating in that region are allowed in commerce as such. The purpose of the law is to protect the reputation of the regional foods and eliminate the unfair competition and misleading of consumers by non-genuine products, which may be of inferior quality or of different flavour. To be labeled "AOC Martinique Rhum agricole" rum has to be produced from cane grown in an area authorized by the AOC decree. Fort-de-France area : municipalities of "Le Carbet", "Fort-de-France", "Le Lamentin", "Saint-Joseph" and "Saint-Pierre". La Trinité area : municipalities of "Basse-Pointe", "Gros-Morne", "Le Lorrain", "Macouba", "Le Marigot", "Le Robert", "Sainte-Marie" and "La Trinité". Le Marin area : municipalities of "Le Diamant", "Ducos, "Le François", "Le Marin", "Rivière-Pilote", "Rivière-Salée", "Saint-Esprit", "Sainte-Luce", "Les Trois-Ilets" and "Le Vauclin". Cultivation yields are limited to 120 metric tons of sugarcane per hectare (currently Martinique average yields are closer to 70 mt/ha). In comparison, sugarcane yields can easily exceed 150 mt/ha in other parts of the world. Such a limit was introduced to avoid unsustainable agricultural practicies such as massive fertilizer use. "AOC rhum agricole Martinique" specifications also limits the use of irrigation technology by prohibiting more than four months of irrigation per year. Sugarcane having high water requirement, this limitation is really significant and restricts sugarcane cultivation to well-watered fields and prevents overproduction which could hinder "AOC Martinique rhum agricole" quality and damage Martinique unique landscapes. Similarly, any application of substances on the canes to promote their maturation is prohibited. Approved sugarcane crops cultivated for the production of the "rhum agricole AOC Martinique", are listed by a governement appointed body. Harvest is also time delimited as it cannot begin earlier than the 1st of January and has to end no later than August 31. Rhum agricole wort should only be made of fresh sugarcane juice obtained by grinding and pressing of sugar cane. No addition of syrup or molasses is allowed. Juice quality is controlled with a minimum sugar content (Brix > 14 ° Bx) and a minimum pH (pH > 4.7). These criteria limit juice concentration and acidity to reasonable values to avoid uncontrolled fermentation and thus prevent ethanol production troubles (such as production of methanol or other undesirable products). Juicing is also regulated by prohibiting technics such as hot extraction which could damage juice quality and alter rhum agricole specific bouquet. This page on fermentation describes the mandatory conditions to be met by the Vésou fermentation for "rhum agricole AOC Martinique". 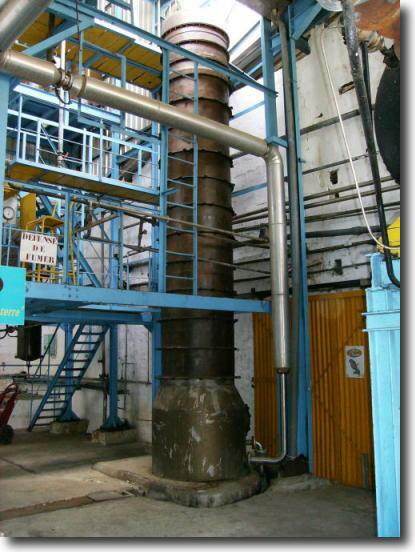 Approved distillation columns and practices. Reflux through one or more chauffe-vins or copper water condensers. Rectification of the spirit (second distillation aimed at reaching higher alcohol concentrations) is forbidden. In addition, alcoholic grade in the distillation output must be between 65 ° and 75 ° to meet the requirements of the AOC specifications. Rhum "blanc" Martinique (white rum): colorless rum which have been laid still for at least three months and not more than three months if rum has been stocked in oak barrels. Rhum Martinique "élevé sous bois" (cask aged rum) : Rum has been aged in oak barrels within the production area and for at least 12 uninterrupted months. Rum must also contain at least 250 grams per 100 litre of pure alcohol of volatile elements other than ethanols and methyl at the end of the aging period of time. This minimum concentration guarantees the cask aged rhum agricole's bouquet. Rhum Martinique "vieux" (extra aged rum) : Rum has been aged in oak casks (not exceeding 650 litres) in the production area and for at least 3 uninterrupted years. Rum must also contain at least 325 grams per 100 litre of pure alcohol of volatile elements other than ethanols and methyl at the end of the three years. This minimum concentration exceeds the one imposed on cask aged rums to guarantee a richer bouquet. Whatever category the rum may be, no rum with the designation of origin "Martinique" could be sold with an alcoholic concentration lower than 40%. ➀ Reference : IEDOM reports. ➁ Reference : Histoire du rhum - A Huetz de Lemps - p257.